Takeaway: With all the different sign materials out there, what are the best ones for specific environments? Can you imagine relying on a cracked, chipped, and completely faded sign to keep people from wandering into a dangerous confined space? Probably not. Damaged, battered, and faded signs are almost as useless as having no sign at all, which is why selecting the right material for your sign is every bit as important as the message that goes on it. Workers depend on signs to warn them about potential hazards in their work areas. And they need these signs to withstand the elements and their environment. A sign that falls apart of fades into intelligibility after repeated washdowns isn't just a bad purchase, it's a purchase that could cost someone their life or livelihood (find out How to Master the Science of Sign Visibility). Sure, having a wide variety of material options is convenient. But it can also complicate the selection process. The key is identifying the material that best meets your needs for durability, longevity, appearance, and budget. If you need a short-term sign to identify a temporary hazard, you don’t want a material that has a long lifespan – that’ll be bad for your budget. On the other hand, taking shortcuts and choosing a weak material for long-term use means your sign will need to be replaced frequently. Environmental conditions will dictate the material you choose. The harshest environments are often outside, and those working in the field face many hazards, often with fewer controls than are found in an indoor workplace. They can't depend on a warning sign if it fades after repeat exposure to sunlight. So, What Materials Are Best for Different Environments? When you’re not sure which sign material to use, talk to a safety identification expert. Or, use this guide to find industrial materials designed to withstand the elements they’re exposed to. Every industry has its own example of harsh environments, but they’re all after the same thing: durable sign materials. Harsh environments can include anything from direct sunlight, chemical exposure, high pressure washdowns, and industrial impacts. 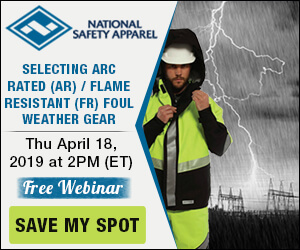 As more solutions and features become available for AR/FR Foul Weather Gear, selecting a garment can be more complicated. Join Dionne as she discusses how to simplify the selection process by examining Applications, Hazards, Standards, and Features. All materials have different attributes and thinking about what type of environment your sign will be exposed to is important. Look for the strongest industrial materials that can withstand harsh environments. Industry workers performing work in boiler rooms, chemical plants, mining, maritime, and petroleum plants are exposed to consistently hot temperatures and need a material that is just as tough as they are. When looking for the ideal material for hot environments, always check the specified temperature rating for the material. You’ll also want to consider the maximum time the material will be in the hot environment. For instance, it might make a difference whether the room is always hot or only when the welder is working in the area. Workers in snow cleanup, sanitation, food processing plants, and other industries are exposed to cold environments. And when thinking about a sign material that will withstand these elements, some do better than others. Most materials can stand up to cold weather, but always look for the coldest temperature rating. If moisture gets on a material that’s not rated for wet environments or washdowns, you’re going to have to replace your sign quickly. Avoid the hassle and select a sign material built to withstand the wet environment it’ll be placed in. There are many materials out there that can endure constant moisture and repeated washdowns. Paper materials, however, will completely fall apart in a wet environment. Always check the rating of the material before making your final decision. Some office settings look a little harsh but they don’t require extremely durable signs. Signs placed in office environments need to be attractive and tough enough to remain in good shape throughout their lifetime. But you don’t want to kill your budget with a material that is ideal for outdoor applications when your sign is going inside. Materials that are designed for basic indoor or framed office applications are ideal (learn more about Office Health and Safety). By nature, warehouses have a ton of traffic. Selecting a sign material that’s resistant to forklift traffic, skids, and abrasions is necessary. Warehouse signs should be able to withstand chips, scratches, abrasions, and cracking. Always consider whether the sign material will need to be printed with one or two sides, hang from the ceiling, or be mounted onto the wall when determining the best material for warehouse environments. When it comes to safety identification, it’s never a good idea to cut corners. Selecting the right material is critical to the effectiveness of your sign. To make sure you get the durability you need, always contact a sign material expert before making a purchase. Mauriah performs industry research to educate others about products, markets, and standards/regulations. She writes content that’s topical and solves problems, while engaging reader with unique perspectives. Her goal is to create safety experts in the industry of signage and facility identification. Industrial Identification: Should You Use Plastic Labels or Metal Plates?